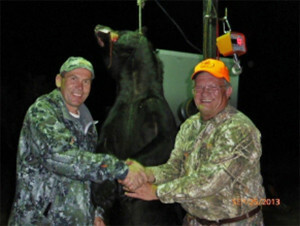 Pure Michigan Hunt winners Dave Gittins of Kawkawlin (right) and Jim Bosscher of McBain celebrate the 450-pound bear Gittins took in the Cadillac area. Every year Pure Michigan Hunt (PMH) winners get to spend their fall hunting seasons living out their dreams—pursuing elk, bear, deer, turkey and ducks in Michigan’s outdoors. All three 2013 Pure Michigan Hunt winners recently harvested bear. Dave Gittins of Kawkawlin and Jim Bosscher of McBain both successfully harvested bear in the Cadillac area, using Wayne and Rob Nixon as their hunting guides. Bosscher harvested his bear accompanied by Jenny Olsen from Michigan Out-of-Doors TV. “Hunting is all about the experience and the friends that you are with that make the memories,” said Bosscher. Jason Webb, the PMH winner from Westland, also harvested a bear on public land in the Lewiston area. Webb hasn’t hunted for his elk yet; he’s waiting to hunt the December elk season, while both Bosscher and Gittins have already taken theirs. PMH winners can hunt any open unit, during any hunt period for that animal. They are not restricted to a unit or a hunt period. Pure Michigan Hunt winner Jim Bosscher of McBain with his 6×6 elk, taken near Vanderbilt. Gittins shot his choice elk on the morning of Sept. 15, the second week of the early elk hunt. Bosscher started out his elk season passing over many bulls, and even harvested a 9-inch-bearded turkey in between his morning and evening elk hunts. 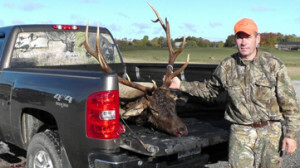 His waiting finally paid off on Sept. 29,when he took a 6×6 beauty. Bosscher used Chad Sides and Brett McVannel as guides to help land his bull in the Vanderbilt area. “I had a fantastic time and will remember it forever,” Bosscher said. For hunters who have dreams of experiences like this, there’s still plenty of time to make 2014 the hunt of your lifetime, by applying now and applying often. Along with all of the hunting licenses, each winner will receive a hunting prize package valued at more than $4,000. Visit www.michigan.gov/puremichiganhunt for more information and to purchase Pure Michigan Hunt applications. Waterfowl season is coming up next for the Pure Michigan Hunt winners; look for more of their adventures coming soon.